DOT’s “Don’t Be a Jerk” campaign debuted today with spots making the rounds online. I must admit that the videos are far more benign so far than I had anticipated, although it remains to be seen what the Post or CBS2 will do with them if the chance arises. I stand behind my original belief that using the language of the backlash to advance cycling as a legitimate mode of transportation is counterproductive. Imagine if DOT had kept everything under the umbrella of its “Bike Smart” campaign. Very little about these ads would have had to change: the department still would have been able to show Mario Batali going the wrong way down Broadway, Paulina Porizkova cutting off a group of pedestrians, or John Leguizamo riding on the sidewalk without linking the word jerk to cycling. Like Ben, I like that the criticism comes, for the most part, from other cyclists. Having drivers yell at cyclists would have been a big mistake. They paint a nice picture of New York as a place with bike lanes, pedestrian plazas, and parks, bucking the more typical concrete jungle imagery. Don’t tell Heather Haddon, but the Mario Batali spot, with its accordion-flavored soundtrack and people sitting at outdoor tables, makes riding near Madison Square Park seem positively European. Sadik-Khan’s cameo in the Leguizamo spot is like an Easter egg for transportation nerds. The little dinging bell at the end of the ads is a nice touch, adding an extra touch of friendliness to the series. If you don’t know who they are, Batali comes off as a clueless Crocs-wearing tourist and Porizkova as a Beautiful Godzilla; neither one is really a jerk. Only Leguizamo shows some good old fashioned New York ‘tude befitting the series’ tag line. Speaking of clueless, who shoots a PSA about bike safety and then forgets to tell the ad’s star to buckle his helmet? In the Porizkova spot, it’s not exactly clear who’s at fault, the pedestrians or the supermodel. The sequencing seems off and the message is dulled as a result. The relationship between cyclists and pedestrians crossing the street is perhaps the source of most of the animus in Great Bike Lane War of 2011, and this ad feels like a missed opportunity. Some of this is filtered through my critical eye as a TV producer, so take it all with a grain of salt. I think with slightly better editing, a clearer message, and a more positive tag line that fit the overall tone of the spots, this campaign would have accomoplished all DOT intended it to do and made a more lasting impression on New Yorkers. Entertainment Weekly style, I give the entire series a B. One of the city’s top bike backers yesterday painted cyclists as a bunch of lawbreaking idiots. It’s almost as if the Post received a DOT stamp of approval to continue waging its campaign against cyclists. Instead of marginalizing naysayers in the tabloids, the DOT is enabling them. New York City does not want you to be a jerk – when it comes to riding your bicycle. But if you want to be a jerk when it comes to driving your car, go right ahead. The piece concludes with a sentence that tells me DOT missed a major opportunity to educate New Yorkers about bike lanes and safe streets. Bike lanes have come under attack from some critics who say they block parking, hamper pedestrians and are unnecessary because of the small number of people who commute via two wheels. I doubt anyone forgot anything. 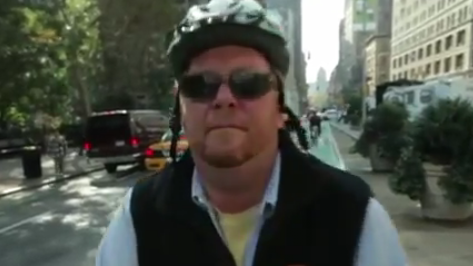 More likely, Batali can not be told to buckle a helmet. At least not for an unpaid cutesy PSA where he is designated “jerk”. I rented a bicycle (a tandem!) last summer in Vermont and the purveyors oh so seriously insisted on both of us wearing crash helmets, for “insurance reasons” you know. I don’t like being choked so I immediately unbuckled it once out of sight–yes, banishing whatever safety joojoo is imagined to come from strapping foam to one’s head for a 5 mph bicycle ride. I didn’t have anywhere else to put the thing so I left it resting on my head like an ugly hat, and sure enough as we rode past a house some dude in his yard started carrying on and making strap-buckling motions with his hands. Cyclists are so weird sometimes. Lets face it, NYC is full of jerks, on two feet, two wheels and four wheels. It is outrageous that cyclists are singled out by this campaign. When have they ever told motorists to stop driving like assholes or told pedestrians to turn off their iPod and pay attention for ten damn minutes while they walk. Cyclists are responsible for such a low percentage of traffic fatalities… it’s really puzzling why we’re being targeted so unfairly. When does the DOT campaign to get drivers to not be jerks and block bike lines start?